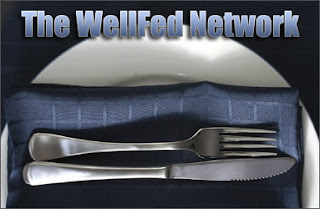 The Well Fed Network (which I write for, see the left sidebar) is now taking nominations for its annual Food Blog Awards. Nominations are made by leaving a comment on the post for each category. The nominations period will close this Friday, December 15 at midnight EST. One category of particular interest to this new food blog is the award for Best New Food Blog and someone was kind enough to nominate Everything Rachael Ray. If ERR makes it to the finals, voting will begin on December 23 until December 31. Don't worry - I will remind you! Make sure you go check out all the categories and nominate all your favorite food blogs. I nominated you, and a few others, including myself (yeah yeah shameless, ain't it?). It's going to be hard to choose in the end! Thank you, Pie. I really appreciate each and every nomination. It's so nice to get good feedback, since I really enjoy writing ERR. I don't envy the judges - there are so many wonderful blogs nominated.